We thought we should do a few things at our place to celebrate the New Year. Eileen woke up the other day to see the ground covered in snow and then declared that Christmas was finally here. Then she looked around and noticed the tree and all the decorations were already gone. To make her feel better we made banner to celebrate New Years. I found a cute idea for a banner at Kaboose. 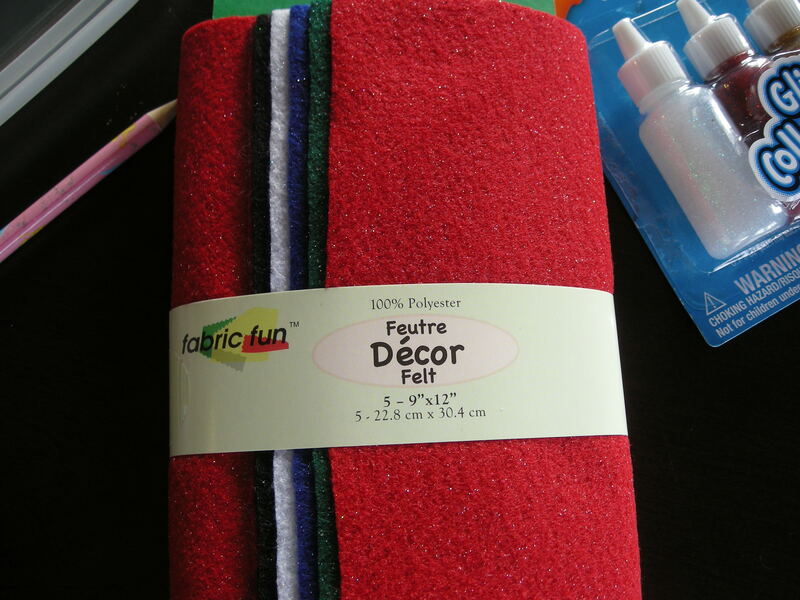 I didn’t have any nice felt around the house so we went by Walmart and I found some cool sparkly felt (the sparkles don’t show up very well in the picture). I cut the strips out as the instructions listed and glued them on the string. 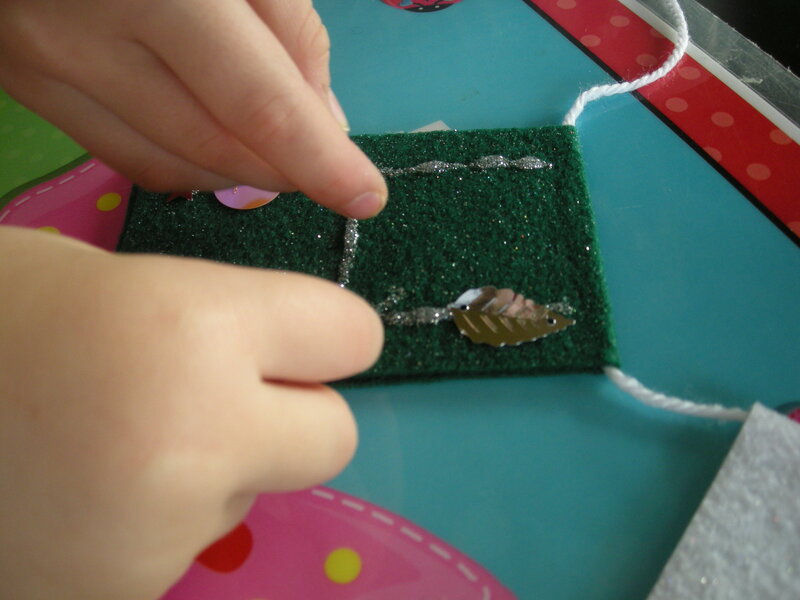 I found that they kept sliding with white glue so I used hot glue to make sure it would stay together. The next day I sat down with the girls to make our banner. 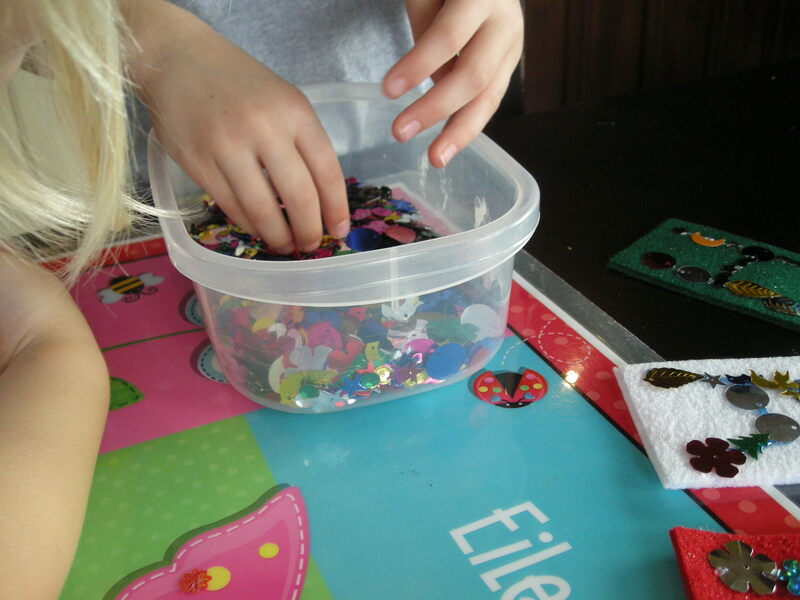 I used the glitter glue to print each letter in uppercase and they put the sequins on. At first I tried to get them to use small sequins but after a few minutes I abandoned that battle and let them do it however they wanted. While it was drying before going on the mantle I decided that it would be a good time to watch Rudolph’s Shiny New Year. I had PVRd this movie when it was on a couple of days earlier thinking the girls might like it. 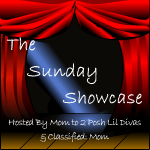 It seems like all the good kids holiday specials are always on after the kids go to bed! For a couple of years now I had been looking for a New Years show I remembered watching as a kid about a New Years baby and as soon as it started I knew this was the one. This special starts right after Christmas when Santa gets a letter from Father Time telling him that Happy the New Years Baby has gone missing – and of course the only one who can find him in a snow storm is Rudolph. Rudolph sets off and meets a number of new characters along the way in his search for Happy. As an adult watching it there are so many inconsistencies that in history that it made my head want to spin. 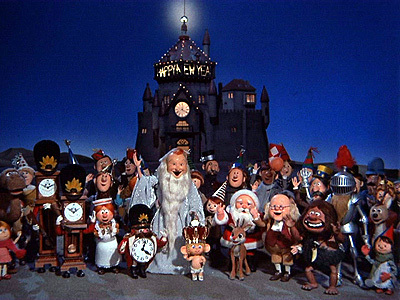 For some reason I don’t have a problem with the more traditional tales and a flying red-nosed reindeer but a number of islands where the Father Time of each year goes to retire is a bit far fetched for me. Kaitlyn actually asked me while we were watching it if the cavemen really lived at the same time as the dinosaurs (because of course they do on island 1 000 000 BC). I did really like the use of time in the film in many of the characters. This is a concept we have been working on and led us to decide we needed to make a special treat for New Years Eve. 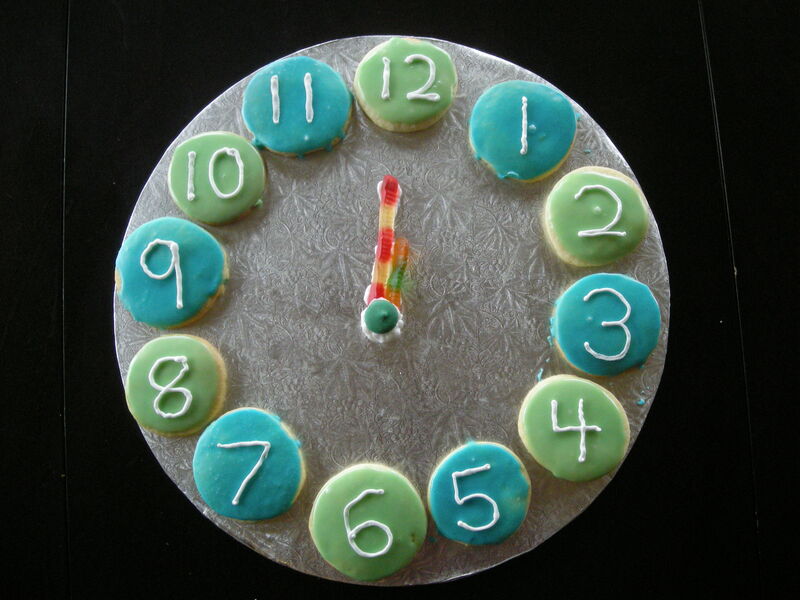 The girls are going to a party with the cousins at Grandmas so we decided to make a cookie clock for them to take. 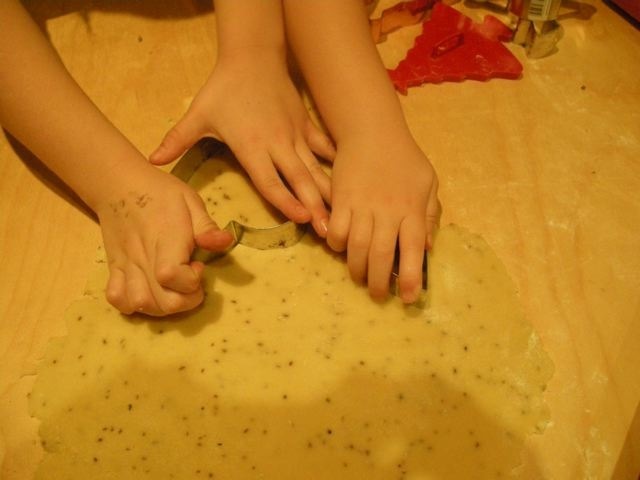 We started by making a batch of soft sugar cookies. 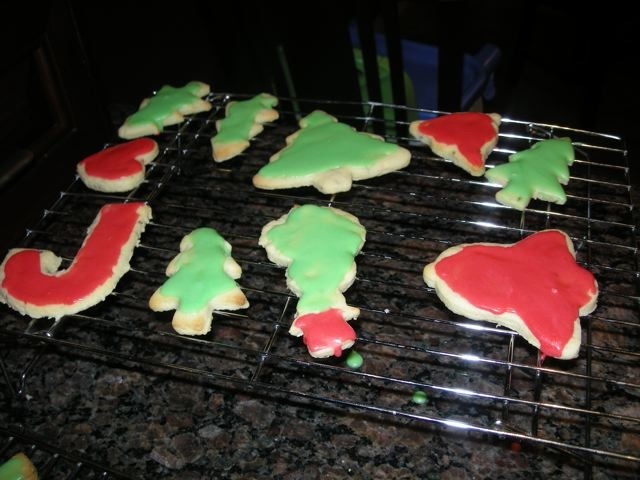 We had a recipe from allrecipes.com that we had used to make our reindeer cookies a few weeks ago, and they worked really well, so we used it again. You could easily use refrigerated cookies dough from the grocery store. Since this was an experiment and we weren’t sure how it would turn out we decided to simply make them circle shaped. We have an awesome box of 101 cookie cutters that has a number of circle cut outs so we picked the size we thought would work best. After chilling the dough for a couple of hours the girls helped me cut them out and bake them. I let them cool overnight and then I made a glaze using another recipe I found at allrecipes.com. This recipe made enough for the cookies we needed for our clock but not for all the cookies we had made. I made two batches of glaze – one in blue and one in green. All I did was dip each cookie in the glaze and then let them dry. After they were dry I used some buttercream icing and piped on the numbers. The girls picked gummy worms for the arms of the clock and I used a chocolate wafer for the middle. You could also use liquorice. It helped to secure the arms with some more icing. Next week while Kaitlyn and I are still off school I think it will be a good time to do some more activities on time, but this was a great start! And yummy too! We decided we needed to do one more thing for New Years, especially since they would be at Gramma & Grampa’s house. Make noise makers! We found a cute idea at Kibmoou. We first called Gramma to bring over any empty water bottles, we didn’t have any. She brought over a few different types and we picked the Gatorade and Powerade bottles because they had the biggest openings. 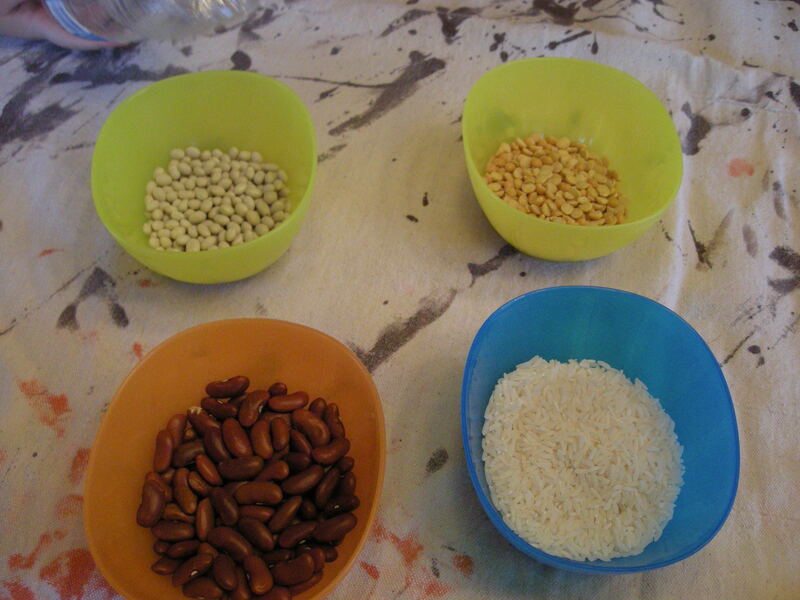 I went through my pantry and picked out a number of things that would make noise in a bottle: navy beans, rice, white beans and split peas. I put a small amount in 4 bowls and told the kids they could experiment to see what filler would make the sound they liked best. Eileen picked the navy beans because their sound was the loudest. 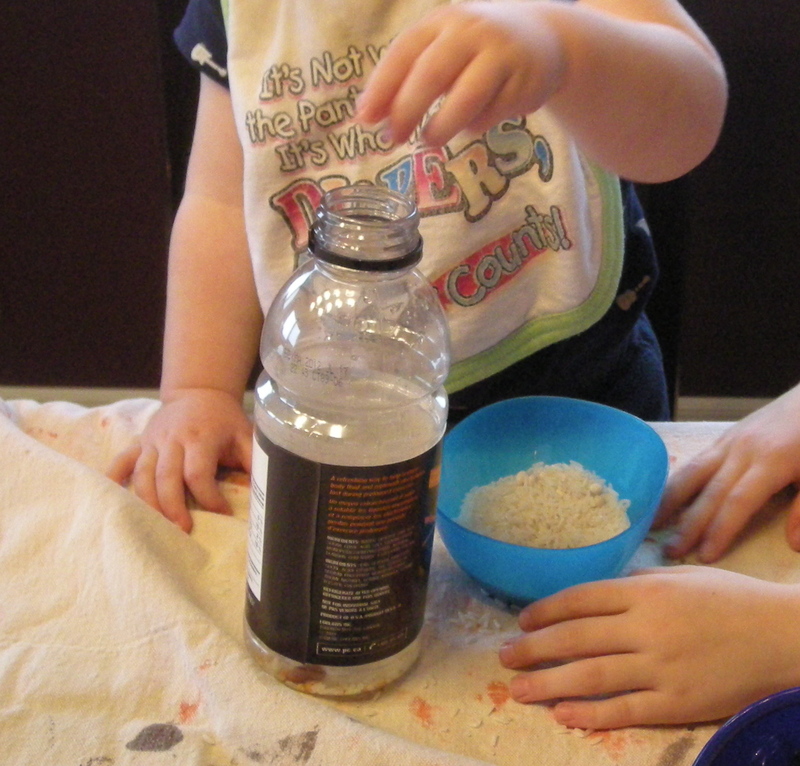 Kaitlyn mixed them with a heavy concentration of rice because she it made the sound she liked. Michael just put in anything he could get his hands on. Our bottles had large openings but if you had smaller openings you might want to use a funnel. After they were full I glued the lids on so they would have not escapees. As an aside make sure your bottles are clean and dry before starting, otherwise it won’t work as nicely. We took off the labels and got started with the decorating. This style of decoration is very easy at this time of year because we had so much tissue paper from Christmas presents. First I gave them scraps of white tissue paper. 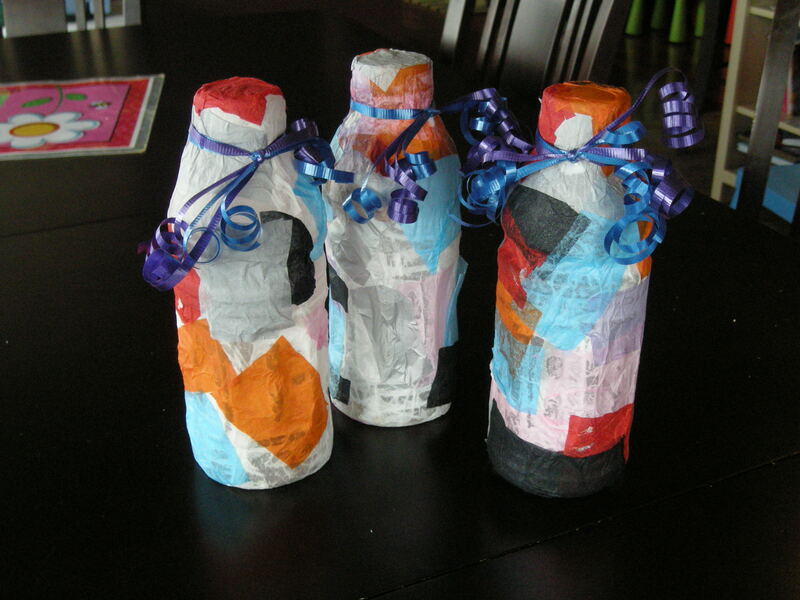 They each covered their bottle by gluing on the tissue paper using glue I had diluted in water. They would lay the paper down and brush the glue on with a paint brush. 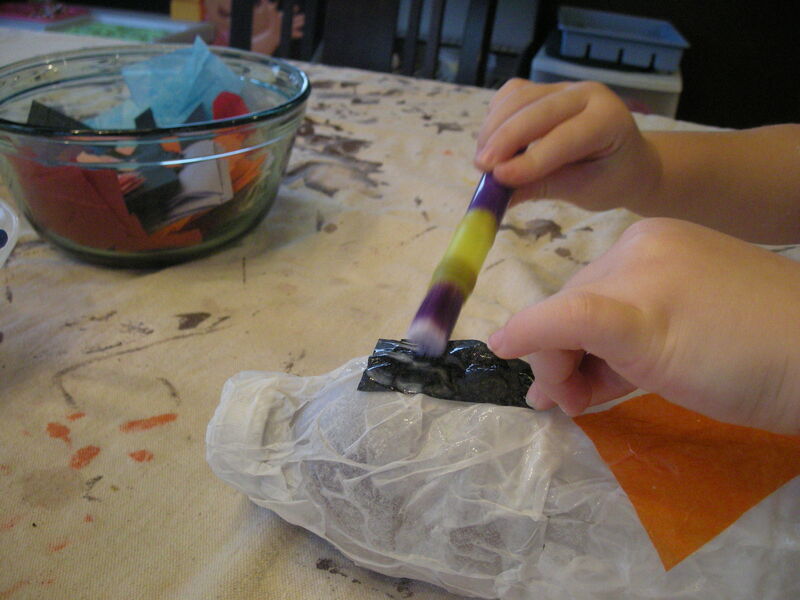 We let them dry a little, not completely and then I gave them a bowl of mixed colour tissue paper and let them make their designs all over their shakers. Kaitlyn pretty much did Michael’s for him but Eileen’s persistency was impressive. I have been very excited with how much patience she has been showing with her crafts lately. Other than Mommy smoothing a few edges she did the entire thing herself! We let them completely dry overnight and then I added some ribbon for them today. Now that I am done my last blog of 2011 I am going to take the kids cookie clock and their shakers over to Gramma & Grampa’s for the girls (who are already there) and then I am going to come home, put on my comfy P.J.s and enjoy some fajitas and a movie with my Gord and Michael. Wishing everyone a Healthy and Happy New Year!!! 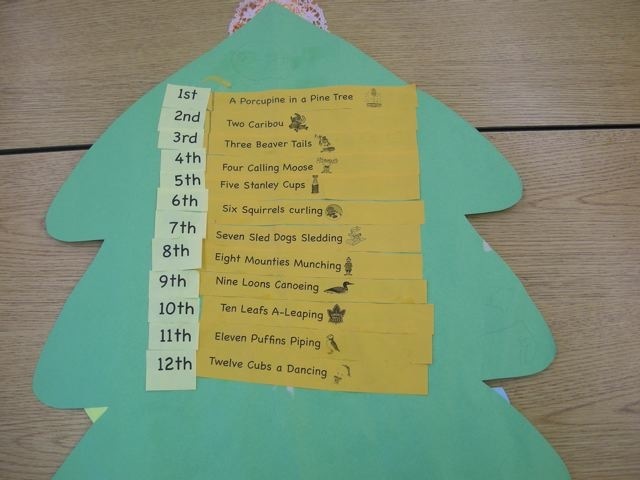 The 12 days of Christmas was a big theme for us this year, at school – and at home. 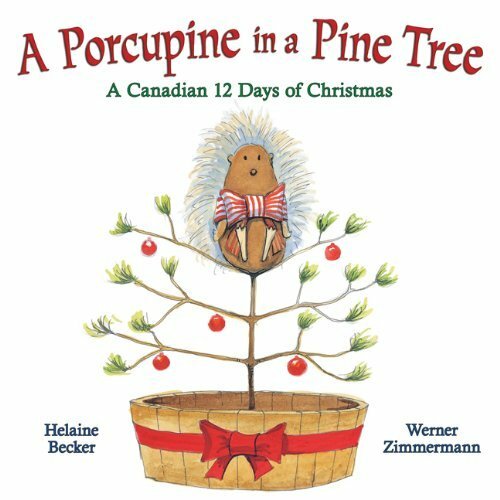 It all started with last year for Christmas Eileen received a copy of A Porcupine in a Pine Tree from her Aunt and Uncle. This is a great Canadian 12 days of Christmas. I had mad the decision to use this book at Christmas in my Kindergarten class a long time ago – but once we got started it took on a life of its own. I started at the beginning of December by reading them the book. Each child was given a large bristol board Christmas Tree and was told we were going to make the 12 days of Christmas. This activity has a lot of teacher prep but it was totally worth it. I had pre-printed and cut out all the gift for Christmas. On the JK pictures I had stencilled in the numbers and on the SK pictures I simply put and empty box for them to print in the numbers. My teaching partner suggested doing something to make the porcupine stand out at the top of the tree so we painted small doilies and glued them on the very top, and then put the porcupine on top. We started with 3 ‘days’ a class but when we got to the higher days we only did 2 a class. For 11 and 12 I saved time by leaving them in a strip and they just glued on. It was a very time consuming activity and took us many classes but it was a perfect way to reinforce our numbers up to 12 that we had been working on in the month of November. Feel free to use the file I made for the activity: porcupine in a pine tree, you will need to print in the number stencils if you wish for JK students. 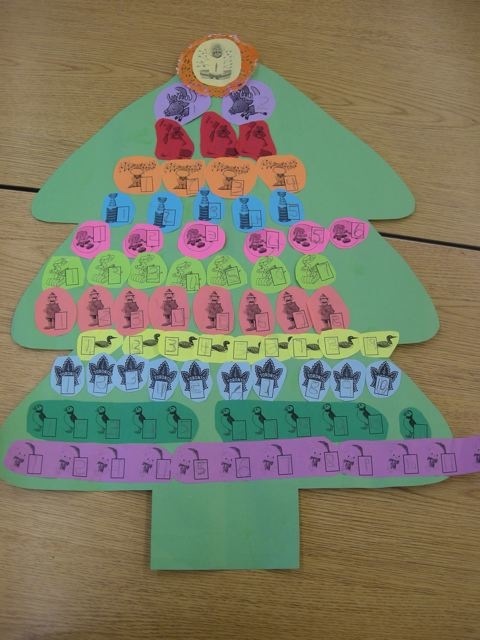 On the last day we sequenced the story on the back on the tree. This helped reinforce the idea of story sequencing and gave me an opportunity to introduce ordinal numbers. I had strips for each day and first they glued them in order. As this was a new concept I only gave one strip at a time (we had done the same thing with our numbers on the front). It was much easier to track everyone as a whole class this way. The same day we added the ordinal numbers before the sentences (1st, 2nd, 3rd, etc). This I gave it them each in a pile and asked them to put in order themselves – it was a great way to see who had mastered their numbers and who still needed some help. The best part was at the end when they took them home. As we were learning each day we were also singing the song – complete with actions. I found a youtube video from a class in Kitchener that I would definitely recommend checking out!! To make some text to text connections I also read a few other versions of the 12 days of Christmas. I found a treaditional version on the discount shelves of our local bookstore. After reading it to them I played them the true classic 12 days of Christmas sung by John Denver and the Muppets!! 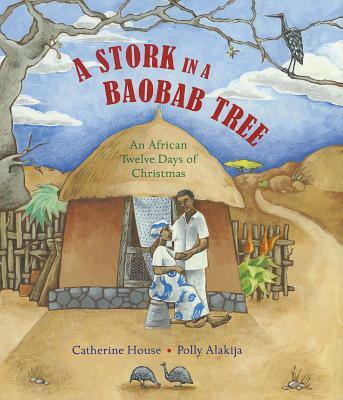 Next I read A Stork in A Baobab Tree: An African Twelve Days of Christmas. I would love to have done more time on this one in my class but we drew some great connections to what they do in African and how it is different and the same to what we do in North America. For example “On the fourth day of Christmas my true love gave to me four market traders” – we discussed how many of us to to the market in our own downtown to get fresh food. 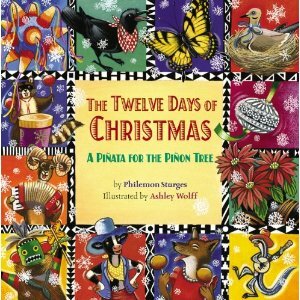 One book I ran out of to do with my class was A Pinata for the Pinon Tree. This was our family book for December 15th! This is the 12 days of Christmas in New Mexico. When I picked it up I thought it would be a Mexican Christmas but instead it is a Southwestern Christmas. The cool thing about this book is that on each page is shows one set of characters decorating for Christmas using the different items for the 12 days of Christmas but in the left hand part of the page is a grandmother character who is baking some sort of treat. 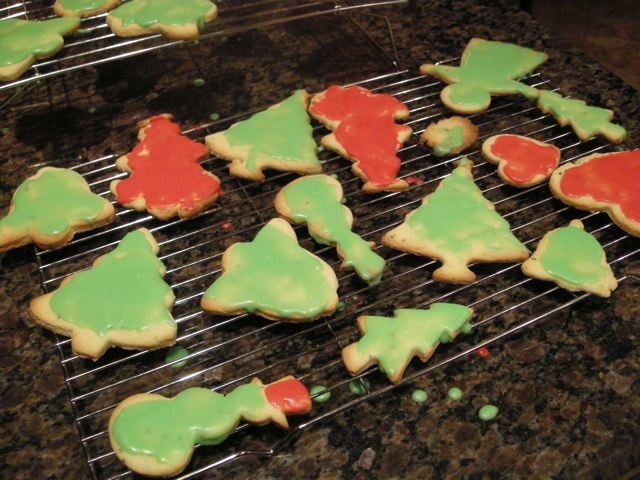 The treat is never mentioned in the story but at the end of the book is a recipe for Bizcochitos – a traditional New Mexican Christmas cookie. It was very obvious that we had to make these cookies, but they called for a strange ingredient – aniseed. The next Thursday when we went to market I asked the spice lady and she had aniseed! We mixed up the batter and made a variety of Bizcochitos. I let the girls pick from all of my cookie cutters so we had a wide variety of shapes. These are a very different tasting Christmas cookie so not everyone may like them – but everyone we gave some to loved them! 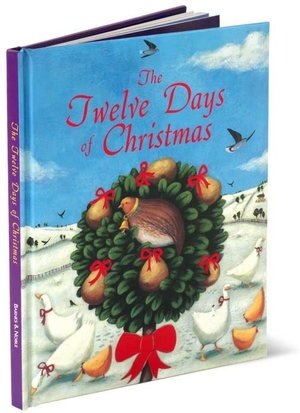 I am looking for more great versions of The Twelve Days of Christmas to add to our library for future years. If you have a favourite let us know!